Professor Saugata Datta has been developing a new research area that will contribute to better understanding of the ways in which toxic metals are mobilized into agriculture, fresh water resources and aquaculture. Arsenic is a known carcinogen and its presence in cereal grains is a serious global health concern. Much work has been done on the effects of arsenic on humans as ingested through drinking water, but very little has been done on arsenic ingested through eating contaminated plants – specifically, rice grown in paddy fields that are flooded with arsenic-laced water (Figure 1). 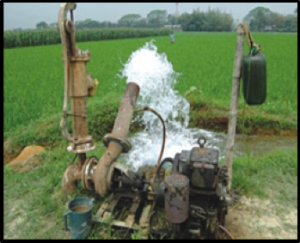 Dr. Datta’s working group and collaborators are currently investigating the effects of cooking rice in contaminated water in an effort to simulate conditions faced by millions of people around the world (mostly noted from SE Asia and other regions, i.e. regions from which the U.S. imports rice). The first stage of this research involved using water and rice gathered from SE Asia, with an emphasis on areas known to export rice to the rest of world, and cooking/analyzing in our laboratories. 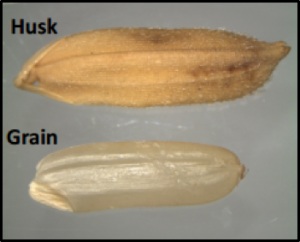 This work is being done to investigate if cooking processes potentially lead to arsenic transformation within the rice grains, specifically a transformation to As3+, a more dangerous form that is also seen in groundwaters. We are hypothesizing that boiling of the rice oxidizes the arsenic to less toxic levels and increase organic-bound arsenic in rice. To further develop this work, we are growing rice in controlled conditions in a K-State greenhouse and irrigating it with arsenic-containing water. 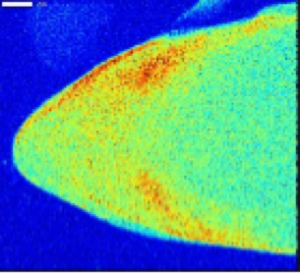 We then boil the rice produced in accordance with the methods of locals in SE Asia and analyze it using X-Ray Fluorescence (XRF) and X-ray Absorption Near Edge Structure (XANES) at the Stanford Synchrotron Radiation Lightsource (SSRL). These techniques allow us to examine the concentrations and localizations of arsenic, along with other pertinent metals, inside the rice grains (Figure 2 and Figure 3). As a result of this research we will have new insights into how arsenic and other metals are introduced into rice grains and how these elements react and migrate in response to traditional cooking methods. This project was initiated by undergraduate Geology student, Brooks Ryan—now a PhD student at Western Michigan University, and is now being carried forward by a Junction City high school student, Zach Bolen.